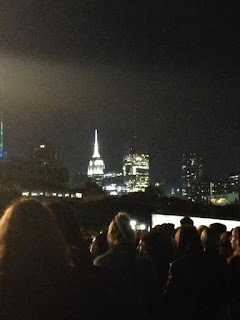 Today--Sunday, September 27th--my friend Jess and I went to Pier 97 on the West Side Highway in Manhattan to attend the first annual Elsie Fest (named after Sally's friend in Cabaret)! Elsie Fest was organized by Darren Criss from Glee and it was a music festival for musical theater. 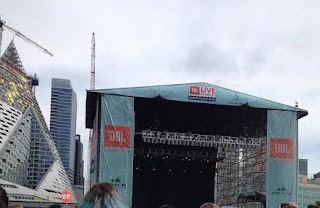 We arrived around 2 pm, wandered around the grounds a bit (stage there, facing the Hudson River; porta potties down there, three food trucks over there, lots of bar places--and all the way at the back, a piano, bar, and musicals singalong). At 2:20, the first performer went on: Tony winner Lea Salonga, who starred in Miss Saigon as well as Les Miserables and was also the singing voice of Mulan and Princess Jasmine! Her voice was incredible and she sang "A Whole New World" with Darren Criss as well as a song from her soon-to-be-in-previews show Allegiance, among others. After Lea's set, there was about a half-hour until the next performers, so we got some beer, joined the singalong in the back for "All That Jazz" and "Skid Row" from Little Shop of Horrors, and then wound our way back to the crowd for StarKid. Halfway through StarKid's act, though, Jess and I began to feel the heat and to feel hungry, so we joined an already gnarly line to get burgers. We stood in front of a group of very talkative (and very noisy) people who dissected Fifty Shades of Grey. 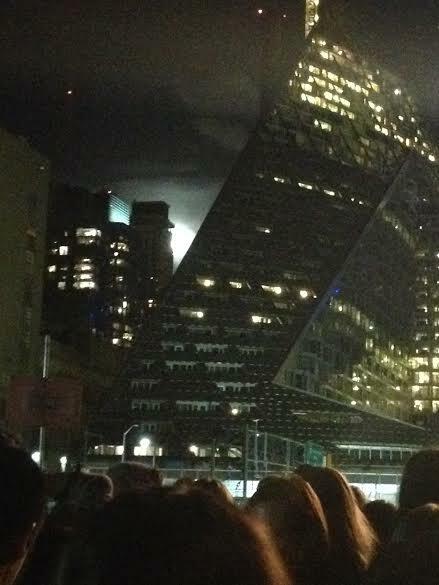 Anyway, the line was long--all of the lines for the food trucks were long. So we missed the next act, Seth Rudetsky. If anyone wants to fill me in on what happened there, please tell me! Just as we turned the bend and could make out the truck's menu (and just as the truck ran out of chicken and hamburgers), Laura Osnes' set began. Jess sent me down the crowd to try to record some of Laura's songs, at least audio-wise. Laura Osnes played Cinderella in Rodgers and Hammerstein's Cinderella on Broadway. I followed her Cinderella video blog on Broadway.com. Her set was eclectic: she did a song from "Tangled," she sang songs from musicals she's been in like "Bonnie and Clyde" and "Grease," did a medley of Cinderella, sang something from the TV show Nashville ("I love that show!" She said). Then she brought out Aaron Tveit (Jess and I both really like him) and as Jess and I munched on our hard-won grilled cheese and six tater tots, Laura and Aaron sang "Falling Slowly" from Once. Oh, sorry, my heart kind of went splat because I love that song--and I love the version from the musical in particular. Aaron Tveit was on after Laura Osnes--and his set was funnnn. There was that Justin Bieber fake-out into Taylor Swift's "We Are Never Getting Back Together." Or his rendition of "Billie Jean." Or his Bruno Mars cover. Or his duet with Laura Osnes on "As Long As You're Mine" from Wicked. Or, y'know, "Fix You" by Coldplay. Aaron singing this has redeemed this song from the one I listened to too much when my college roommate broke up with her college boyfriend and therefore hated. The crowd sang along during his set in a way they hadn't done earlier in the day. Or there was his glory note on his last song, "Goodbye" from Catch Me If You Can. He really sounds exactly like his recordings! No flubs, no wonky notes. After Aaron, Leslie Odom, Jr. was up next! He's currently in the Broadway show Hamilton and had come to Elsie Fest after his show. His, I think, was the most surprising set. I hadn't heard any of his music and didn't really know the shows he'd done--Jess knew him from Smash--but he did a song from Hamilton, then he mentioned that he was once one of the voices of Frankie Valli in Jersey Boys--and did a few Four Seasons songs. One second, he's doing hip-hop; the next, he's doing extreme falsetto. During his set, the sun set and the city lights began to come on. Leslie also sang a really lovely version of "Cheer Up, Charlie" from Willy Wonka and the Chocolate Factory--a super sweet lovely cover. He finished off with "What You Own" from Rent, which he sang with Aaron Tveit. Then Darren Criss finished off the day. He opened with "I'll Make a Man Out of You" from Mulan. He sang several covers, brought on lots of guests--he sang "Beauty and the Beast" with the guys from A Great Big World (the harmonies were killer on that), sang "This Time" which he wrote for Glee, brought out StarKid to do a song about Hogwarts from A Very Potter Musical, and finished off with "Cabaret." The super moon grew more and more visible during Darren's performance. It was definitely one of those only in New York kind of days with a lot of great music and performers. So awesome of you to share, Michelle! I feel like I was there :-) Very nice for me, because I don't get out much anymore! It was a fairly unique experience for me! I've been to concerts but never a music festival and it was the first year, so of course I had to share! I would have been pissed if I waited in line so long and then they ran out of food!! How long did it take to then get your grilled cheese and tater tots? Damned those who get between me and food. Dang! Yeah, some people were tweeting about the food situation. We waited a little over an hour and Jess said that the truck we were waiting at had run out of French fries as well by the time she got up to order. Hopefully, that'll improve next year. So awesome! Wish I could've been there! Yeah, it was fun. I kind of thought there'd be more singing along--kind of expect that from theater nerds. I realized that I have four versions of "Falling Slowly" on my iPod. We kind of thought it might not be too hot because it's September, but no, it was hot. Then it cooled down. There was very little shade except in the beer garden all the way in the back. I think 85% of my iTunes is musical theater. JEALOUS! Seriously, this whole post is filled with awesome. When I first discovered Aaron Tveit, I did some research/stalking, and it is *possible* we might have performed at the same regional school music festival in 2000. *Possible*. But I'll take it!